60th Windhoek Oktoberfest is here! The much anticipated annual Windhoek Oktoberfest is expected to be even bigger when it takes place at SKW from 26 to 27 October. Having developed from a typical German festival to one of the country’s most culturally diverse events, the this year marks the 60th consecutive year that the Windhoek Oktoberfest is taking place. 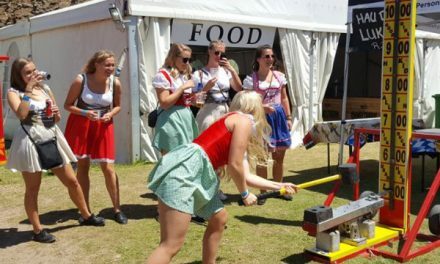 Chairman of the Windhoek Oktoberfest committee, Norbert Wurm said that the diversity in participants and guests, both local and from across the world, has made this event even more colorful as time goes by. “While the traditional Kirchdorfer band from the Munich Oktoberfest in Germany, as in recent years will again be this year’s main entertainment, we have a few surprises up our sleeves for 2018. Furthermore, the Windhoek Oktoberfest has over the years proven to be a great family event, with a perfect mix of traditional games for all ages, accompanied by good traditional Bavarian cuisine that is always available to satisfy that crave for a bite of bratwurst, or a salty pretzel that tends to naturally accompany one throughout the festival. It is a celebration of culture, which also celebrates our diversity in showcasing German roots but with our Namibian uniqueness, originality and authenticity,” Wurm said. Moreover, one lucky Windhoek Oktoberfest supporter stands the chance to walk away with beer for a year from Namibia Breweries Limited (NB), through the ‘Shazam’ competition. Oktoberfest Shazamable watermarked radio adverts will be broadcast on Radio Kosmos, Radio Wave and Hitradio Namibia. The draw of the grand prize, a monthly supply of beer for one full year from NBL will take place on 27 October. Wurm further said that this year the Windhoek Oktoberfest will also introduce for the first time since inception, a cashless system for transactions at the event. More on this is available on the Windhoek Oktoberfest website. Meanwhile, this year, with a cash sponsorship of N$150, 000 (partly sponsored by BMW South Africa), Pupkewitz BMW joined forces with NBL and its founding partner, the Sports Klub Windhoek (SKW), as a partner of the Windhoek Oktoberfest. Tickets to the Windhoek Oktoberfest are available at any Pick & Pay (PnP) outlet in the country, or can be purchased online through Webtickets. 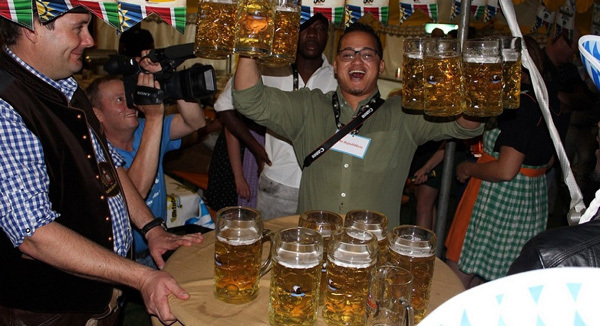 Caption: Media representatives at the 26 September launch were treated to a taste of the popular beer lifting competition that always forms part of the traditional games at the Windhoek Oktoberfest.